Pizza Bliss. Please excuse the poor lighting… we made it at night. I’m not much of a Valentine’s Day person, but I will use ANY opportunity to celebrate with a heart-shaped pizza, plantain chip nachos and roasted vegetables. My boyfriend and I used Elana Amsterdam’s Pizza Crust recipe with a few additions/ substitutions (as noted below), my simple homemade pizza sauce and all sorts of tasty morsels piled high! For all of the dairy-free people, feel free to skip the cheese or use cashew cheese instead. 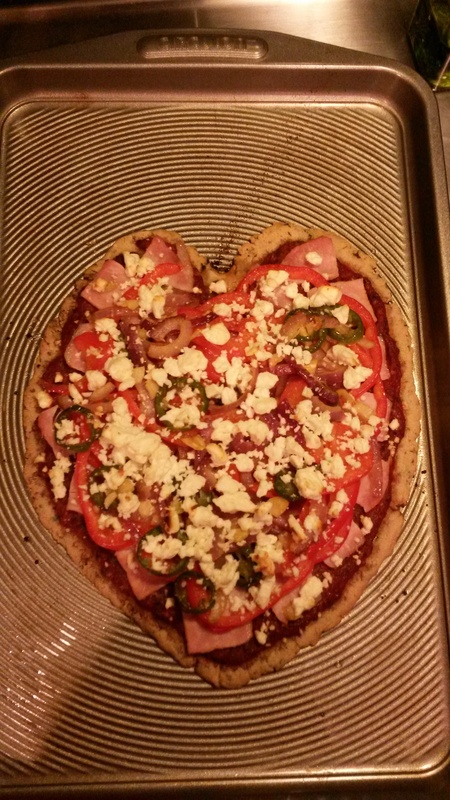 I hope you ♥ this pizza as much as Josh and I did! Cheesy pun intended. 1. Pre-heat oven to 350°. Mix all pizza crust ingredients together to make pizza dough. Place between two sheets of parchment paper and roll out until 1/4 inch thickness. Remove top parchment paper and place pizza dough on sheet pan with parchment paper between the dough and pan to prevent sticking. Bake for 12-15 minutes or until golden brown. 2. While dough is baking, make pizza sauce. Saute garlic in a skillet until golden and fragrant. Add in remaining ingredients and simmer on medium-low, stirring occasionally. 3. Chunk the Canadian bacon to desired size. Using a mandolin slicer, slice the red onion, bell pepper and jalapeno. Smash and mince garlic. Saute garlic and vegetables until desired softness is reached, about 8-10 minutes. 4. Remove the pizza crust when ready and layer with pizza sauce, Canadian bacon, sautéed vegetables and feta cheese. Place back in oven for an additional 10-20 minutes or until cheese begins to golden.